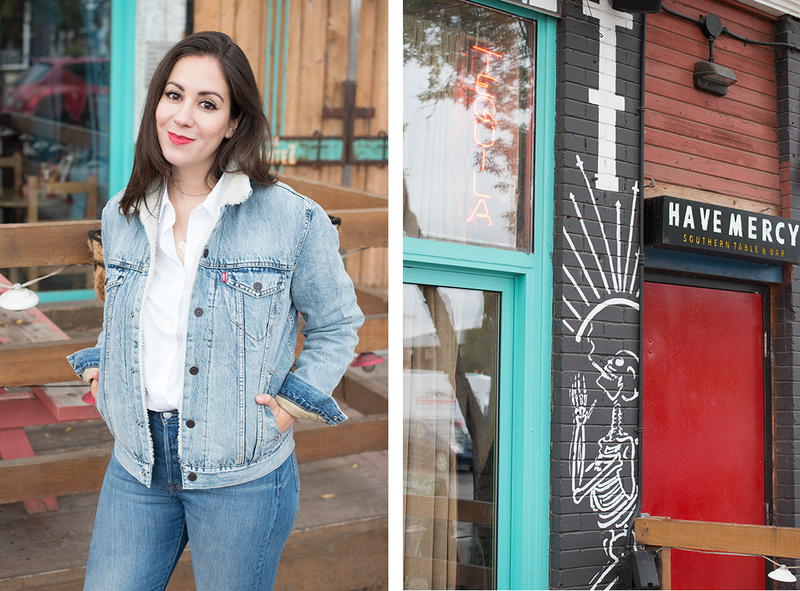 A few weeks back, I was lucky enough to be invited to the new Levis store at West Edmonton Mall to check out their Tailor Shop and have a piece of denim personalized. The eight-year-old bedazzling obsessive inside relished the thought of being able to emblazon a piece of outerwear any which way I saw fit, and so began a week-long quest to find the perfect messaging. And let me tell you, as an overly indecisive person, that was no small feat. 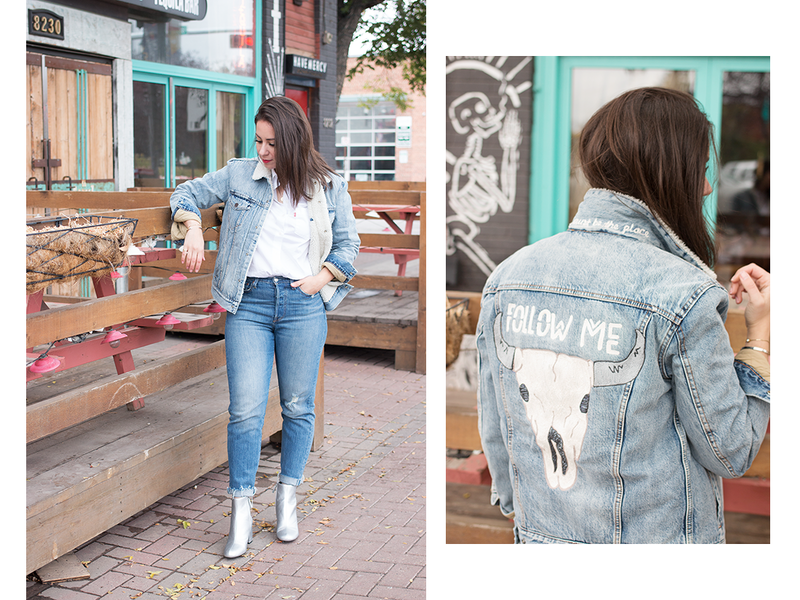 Pinterest boards were created and multiple friends were consulted until I *finally* landed on a concept that felt right (despite the inadvertent potential for inviting stalkers into my life) — a badass bull skull embroidered across the back to tie in the overall vibe of the sherpa jacket (very western, no? 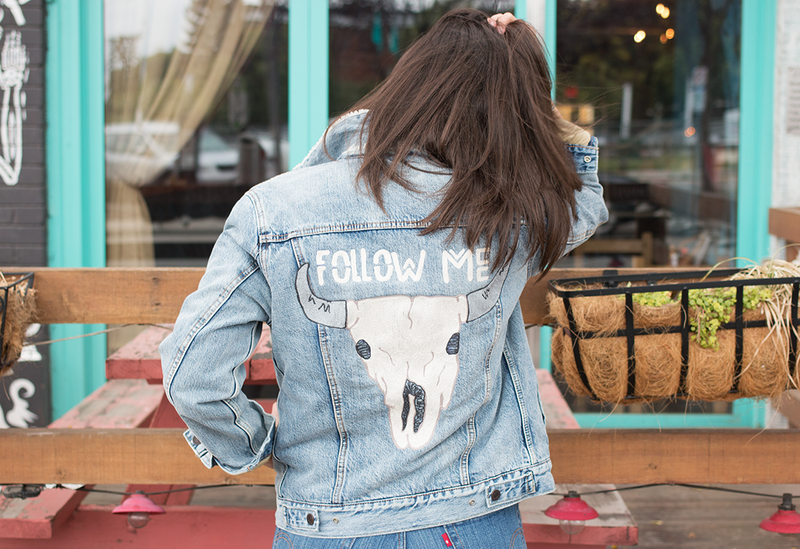 ), with the words 'Follow Me' stitched above as a cheeky reference to my line of work (or perhaps a passive-aggressive plea for more followers— you decide). The tailor was all kinds of insightful, offering suggestions to best bring my vision to life. We talked colours, fonts, placement— you name it— and she was as patient and accommodating to my aforementioned indecisiveness as could be. 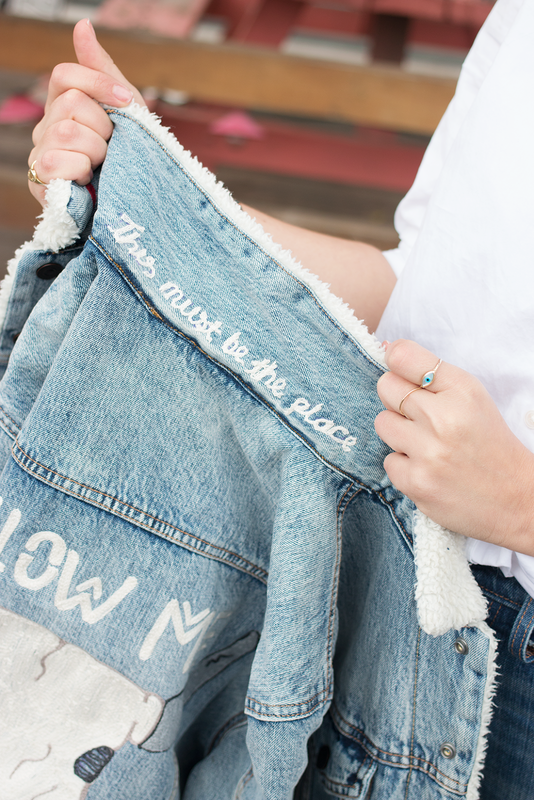 When I was brainstorming ideas prior to going in, I thought about including one of my favourite songs in the design ('This must be the place' by Talking Heads), which we decided to tuck under the back of the jacket's collar in white cursive (nicely tying in with the 'Follow Me' concept). 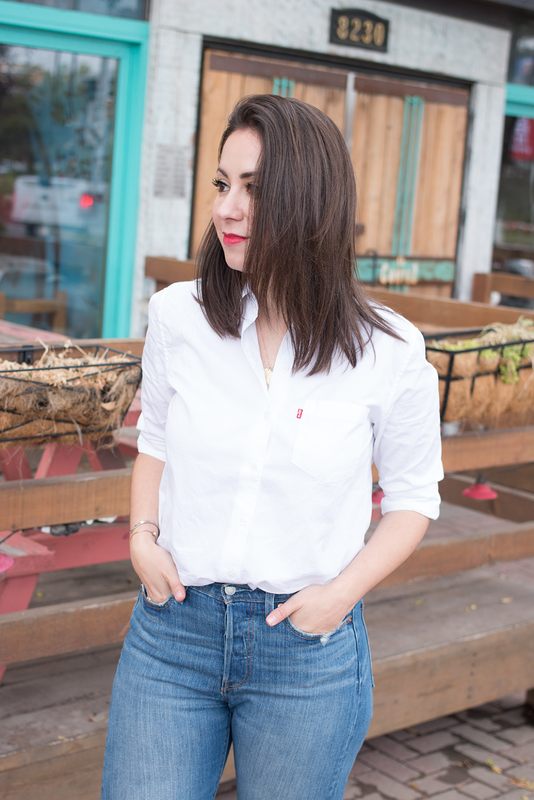 I also wanted to include Boyfriend's initials somewhere on the jacket, which I decided to tuck under the front left side of the collar in a bold red heart, because I'm nothing if not a hopeless romantic. 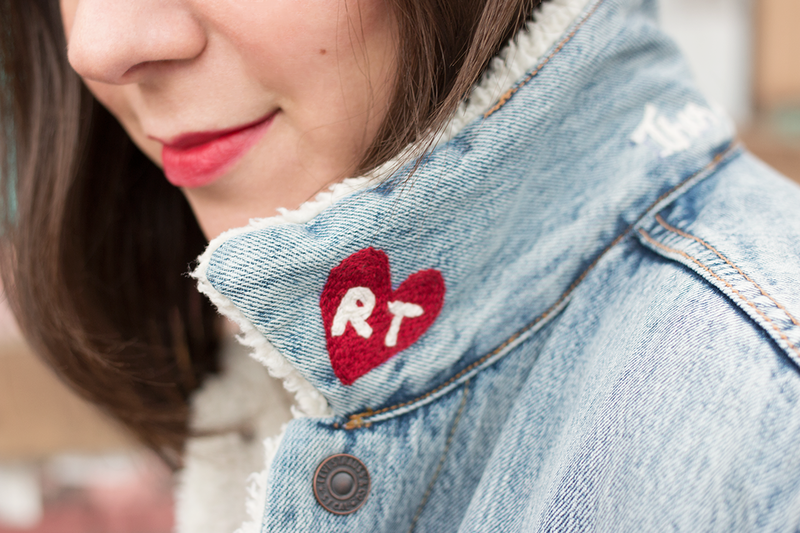 Side note: If you should ever find yourself in need of extra brownie points with your significant other, get their name or initials embroidered on a piece of clothing— believe me, it works. Fun fact? After seeing my sherpa jacket and how cool it turned out, Boyfriend insisted on getting the darker-wash mens version for himself... I'm still holding out hope that someday he gets my face embroidered on the back, perhaps with the words 'Follow Her' floating over my head (I jest). 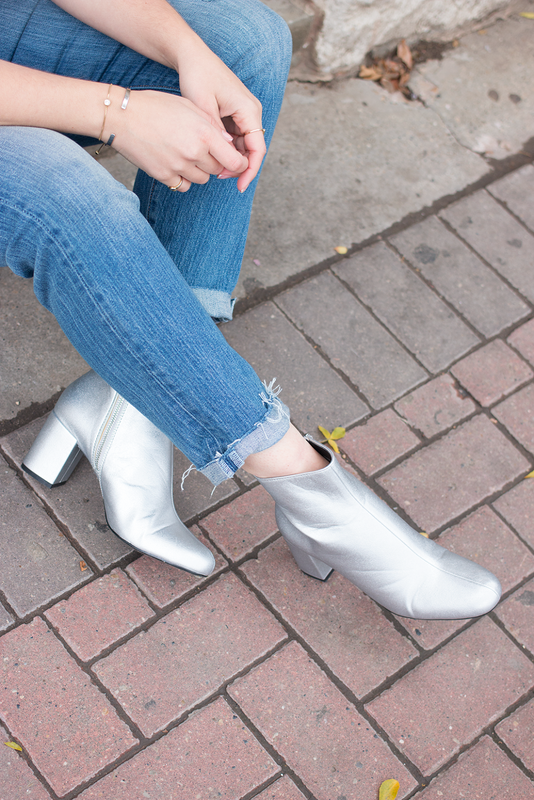 Wearing a sherpa jacket, classic button-up and wedgie jeans, all courtesy of Levis, with metallic silver boots from Zara (last season).